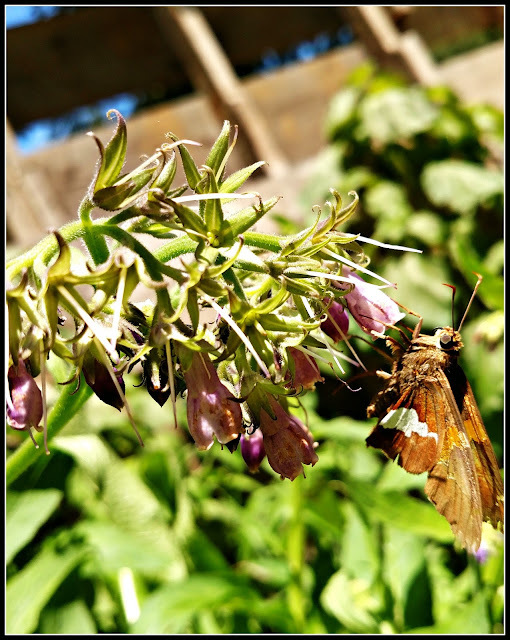 We have skippers fluttering all over my garden. They really like the zinneas and the comfrey, which are now in bloom. I like this skipper, that I caught on my cell phone camera. I watched them flying all around for a good five minutes before I even thought to take a shot. Readers, do you have many butterflies around your place? We have those and they seem very territorial. I saw a monarch yesterday and lots of the yellow and also black swallowtails. The weeds are blooming now so lots out in the fields. I unfortunately see a stink bug on the screen this morning which is the start of the fall plague. I've never heard of a skipper...thanks. no, unfortunately i didn't plant anything this year but i will be better next spring and plant butterfly and bee friendly things! i meant to this year but it just slipped right on by! We don't see a lot, probably because I didn't plant anything butterfly-friendly. Recently, though, we came out on the back porch. It's enclosed with glass slats, and a monarch had somehow gotten caught in one. Larry loosened the slat and it flew away. So glad we saw it in time to help it. Have a great week...I published a blog post today. It is interesting to me to see your comfrey blooming. I love your photos. We have quite a few butterflies that are attracted to some kind of tree that is blooming. We have not been here long enough to have flowers that attract them, but maybe next year. This is a wonderful shot, even if it wasn't a phone!! Yes, we have lots of them. And many look like they have four wings, but they don't. This is the most beautiful one I have seen. I have not seen ones with this brilliant white stripe. Also a great eye. Very well done. Now that you remind me, I will post mine later in the week. a perfect moment captured - i so love butterflies! We do, and I can never get to my phone (which is all I use) in time. That's a great photo, Lisa. I really like it. We do have a lot of butterflies, but not as much as we did a few years ago when my husband planted butterfly milkweed. We have very few butterflies here, but tons of dragon flies. We are having quite a few, at the moment. I was chasing one pretty butterfly yesterday morning but it wouldn't stay still. In the end, I gave up! I have seen quite a few lately. You managed to take a great picture. Yes, we have some, especially out where the weeds are tall! You got a great picture of him!